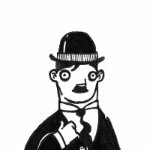 I finally decided to make a place to collect my ramblings about mobsters and give myself a chance to stretch my drawing and writing muscles. I have decided on a format where I can draw a character with a name and write a little story about them for each post. I know, I know, it’s called “The Daily Mobster” and I don’t really post daily but “Daily” sounds much better than “The Twice-Weekly Mobster” or “The Couple of Times a Week Mobster.” So, join me and the characters, and we will see where this leads! See my other, non mobster work at sketchbookjack.wordpress.com. The content on this site is provided to the readers free of charge and while we greatly appreciate your readership and support, it does cost to keep a website going, if only for the time and effort. If you like what you see and read, and want to further support The Daily Mobster and its future endeavors, please, feel free to donate and help keep it going. Want to contact me for commission work, have greeting cards made, have a custom mug shot of yourself or a friend made, or have an idea for a funny character or a drawing of a character itself? Feel free to contact me with the following form. Regarding custom mug shots specifically: I will need a photo of you, online is fine, preferably one that shows off your features, meaning the face is not too obscured. The link to purchase your mug shot will be emailed to you directly. Regarding a mobster submission: I love fan art and love ideas for new characters. Send me your links to your own mobsters, or if you have an idea for a Daily Mobster, send it on over and it just might appear as a post!